Nearly 75% of young women in foster care report being pregnant by 21, and nearly 50% of young men in foster care report impregnating a woman by 21, according to the National Campaign to Prevent Teen Pregnancy. In addition, their children are five times more likely than those in the general population to spend some time in foster care. 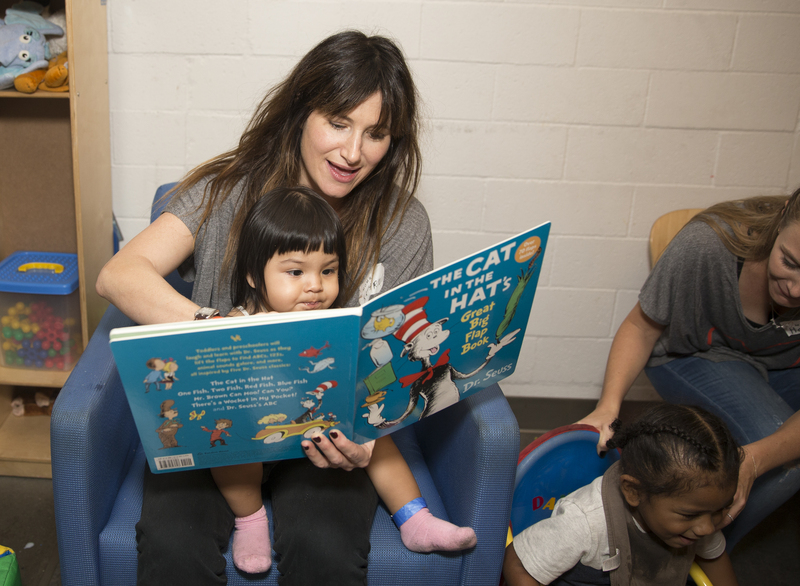 The Alliance of Moms (AOM), a Los Angeles-based auxiliary of The Alliance for Children's Rights, seeks to support those young parents and their children, while helping to end the intergenerational effects of foster care. Last Saturday, AOM held its flagship event, Raising Baby, an educational health and wellness day for pregnant and parenting foster youth. At the event, Alliance of Moms' volunteers were able to bond with young parents and learn from each other's experiences. The high-powered group of volunteers included a number of celebrities, such as Kristen Bell, Kathryn Hahn, Jordana Brewster, Lindsay Price, Baron Davis, Sarah Wayne Callies and Marsha Thomason. 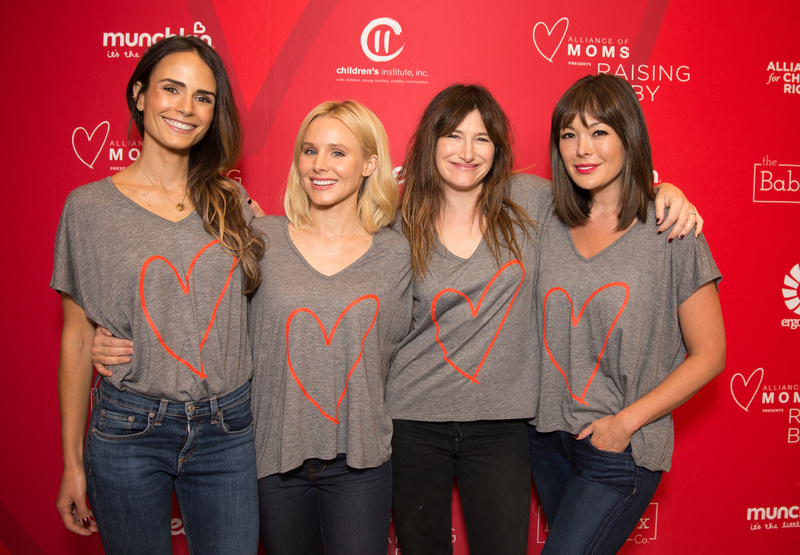 Kristen Bell, a regular volunteer with the Alliance of Moms for over a year, said of her involvement, "It solidified something I already instinctually felt, which is I have a social responsibility to be the village for someone else. I feel that is part of my social contract with the world." The Alliance of Moms is all about the mantra, it takes a village to raise a child. The group's volunteers pride themselves on creating a community of "moms" -- which the group categorizes as, "anybody who chooses to foster and love the kids in our community" -- that support each other and the young parents they serve. The groups volunteers commit themselves to helping some our most disenfranchised feel empowered. In her speech to open the event, Bell said, "They [the Alliance of Moms] are genuinely wanting to give you the support system that you need and you deserve." Asked about learning at the event, Bell said, "I know two experiences of raising a child, my older daughter and my younger daughter. We pull in these experts, so that these mothers can have more than, 'This worked for me. This might work for you.'" The event's volunteers aim to support the young parents in whatever way possible, whether through babysitting or giving advice. Asked about her interest in the event, Kathryn Hahn replied, "Kristen told me about the event, and I really just jumped on the opportunity." She continued to say, "I'm just excited to take something off these mommas plates for a few hours. I'm just here to babysit and to learn. Being here is just common sense." Raising Baby focuses on early childhood and how to help the young parent attendees support their children in early years, with workshops on a range of topics that include talking, reading and singing to children; the importance of sleep and early attachment; fatherhood; and the positive effects of music on the brain. "Early childhood is the key to everything. If these children can get attachment, not just physical but emotional stuff, too, that's really important. You just think that you need all the support that you can get. That's really imperative," said Kathryn Hahn, talking about her interest in supporting the young parents and children. In addition to the workshops, the Alliance of Moms provided the young parents with several hundred dollars worth of products in goodie bags given to each family. The bags included items like tote bags, shoes, lotions, food processors, and a variety of other practical products that these young parents might otherwise lack. At the event, nearly 100 volunteers served 82 families. The parents walked away from the event full of new information and a large support system, and the volunteers left with new understandings of the young parents. One volunteer, Louise Lynch, summed up her feelings of the day in an Instagram post that read, "Sometimes the lives of these young mothers, in the foster care system, seem so far from my own, but sometimes our love for our babies and our wonder at them unites us. The bond of motherhood can connect and inspire."